Yoga instructors: how great would it be to shine in a spotlight and teach in 360 degrees? Introducing the lily pad of yoga mats, Yoga Direct’s roomy 6-Foot Round Yoga Mat is one of a kind! We also highly recommend this mat for meditation, tai chi, and larger-bodied yogis. This mat will keep you hygienically-sound vs. a standard yoga mat: feel free to reach and stretch out in public areas without touching the ground. The Round Yoga Mat is also perfect in your living room: you can actually complete an entire yoga DVD without having to readjust your yoga mat, as poses transition from side to side and forward to back. The 1/4" extra thick 6 Foot Circular Aerobics Mat is the perfect mat for all types of exercises. The mat provides extra cushioning between you and the floor, resulting in a more comfortable workout. These mats are made of extra thick, durable foam, and have textured, non-slip surfaces on both sides of the mat giving you the ultimate workout space. Bought this as a gift for my yoga instructor. She has been talking about wanting one for a while. She was thrilled to death. Loves the thickness and stability of it. I would highly recommend this mat. I absolutely love this mat! It rolls out nicely, and it gives me extra space to move around! I highly recommend it! Also, Yoga Direct has the best price on this mat. 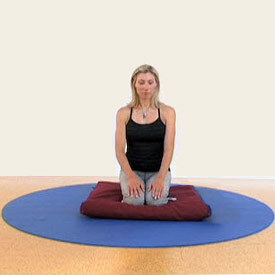 This round mat is excellent to use as an instuctor. You are always at the top of your mat when teaching from any direction.